It happens to everyone: From time to time, you forget your usernames or passwords, including the one to your web hosted control panel. Generally, though, you don’t need to contact your web host to get a new password or retrieve your username. You can do it yourelf. 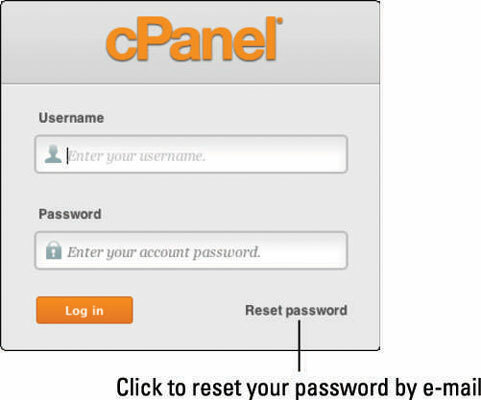 Where you log in to your control panel, there is usually an option, often underneath the login box, to reset your password. Some control panels provide an option to retrieve your username as well. If that isn’t the case, though, you should log in to your web host’s billing dashboard (if it is separate from your control panel). There you should find either a link to the original e-mail the host sent you, which had all of your login details, or a page where you can view and change your server login details. It is unusual that you need to contact your host for help with usernames or passwords, but don’t be afraid to ask if you need to. Your host’s staff members will probably laugh about it in the break room, but don’t be embarrassed. We’ve all done it at one time or another!